So much has happened this year, for myself and those in my family. When I think through this past year it's amazing to me how much has changed and how much I've grown. I am not the type of person who makes New Year's resolutions, because things almost never turn out the way you think they're supposed to, then you just feel disappointed. But I do think that it's a good thing to reflect on what the Lord has done for you during the past year at this time. The following is a recap of my year and some of the things the Lord has taught me. January/February 2008 - I started out this year as a newly engaged girl, a shining ring on my finger and a brand new Yorkshire puppy named Ralphie. I spent these first couple of months looking at wedding websites and magazines, trying to decide how I'd like to organize the wedding. At the end of January I went back for my last semester of dental hygiene college. This was probably the most stressful semester of hygiene school that I had to endure, mainly because of preparing for and worrying about my National Board Exams. My clinic at dental hygiene school started out rather well, and I was starting to feel more confident about becoming an official registered dental hygienist, and working in the "real world". I also enjoyed my first Valentine's Day ever with anyone, and I felt extremely blessed that I got to spend it with my fiance, Derek! Derek brought flowers and a white teddy bear to my school for me on Valentine's Day (all my classmates were very impressed)! January and February were very blessed months for me. March/April 2008 - Clinic definitely became harder during this time. I failed one of my patients, and I think my confidence was somewhat shattered after that, and i struggled through Clinic for the rest of the semester. I think at this time the Lord was trying to teach me to rely on Him more. I didn't realize it at the time, but when things were going well in clinic, I think I was relying on myself too much, and not taking the time to continue to ask for the Lord's help and thank Him when things were going well. This was one of those hard lessons to learn. I took my written National Dental Hygiene Board Exam in March. The Board Exam actually fell over spring break, and alas as soon as spring break started I was aflicted with a terrible cold. My nose was dripping constantly and I could barely breath - I was sniffing through the entire exam, and I hardly slept the night before because of my cold, and the stress of the exam. Adding to my stress was the fact that no one from our school had ever failed the exam (and I really didn't want to be the first)! Clinic started to work out a little better by the end of the semester, and I finished all my patient requirements on time! I found out that I passed the written boards as well, which was a relief. March and April were months of just trusting the Lord. May/June 2008 - I graduted from dental hygiene college in May! Our program had a seperate pinning ceremony, and I also participated in my college graduation, where I was presented with my Associate of Applied Science in Dental Hygiene (well, it was actually just the degree cover and my degree came in the mail in August, but it was still exciting)! At the end of May I took my Clinical National Board Exam, in which I pick a qualifying patient and clean their teeth, and my work is checked by the board examiners. My patient was actually my dad, and it was rather fun to get to clean his teeth. After the exam we went to Arby's, and I ate a roast beef sandwich and curly fries, and a shake - I just went through a very stressful exam, so I indulged! Jne was a flurry of packing, finishing wedding plans, dress fittings, and finding time to relax when I could. I found out that I passed the clinical boards, and I started gathering paperwork for my license to practice dental hygiene. May and June were months when the Lord helped me through everything I needed to accomplish. July/August 2008 - I received my dental hygiene license in the beginning of July and signed on with a temporary agency. On July 12th Derek and I got married! The wedding went very well, it didn't rain, the guests enjoyed themselves, we got all the pictures taken; it turns out there was nothing to worry about! Except that I almost tripped on the runner on the way down the isle, but I didn't. Derek and I took off to our honeymoon in Hawaii! We had a beautiful time on Kuai, and it was a wonderful start to our married life! I'm so blessed to have found my husband, he's one in a million! Derek and I are determined to go back to Hawaii some day, because we had such a relaxing time there. In August I started work with the temp agency, which went well at first. However toward the end of the month I poked my hand with a dirty dental instrument, and I had to get my blood drawn and tested for any infections that I could have caught. I also learned how Workman's Compensation works. Unfortunately my employer was not helpful, and for some reason after the incident she wouldn't assign me any more jobs. I switched temp agencies shortly after. Derek also resigned from his job at the end of August. July was a month of blessings and love and thanking the Lord for everything He has done for us. August was a month in which our first tests were sent our way, but with the Lord's help they have helped strengthen us in our faith and in our marriage. September/October 2008 - We got a new dog! Her name is Quincy, and she and Ralphie love playing together. Derek started hunting for jobs before he left, and he was almost hired for an analyst position right after. However before he was hired the market took it's down-turn, and the company Derek was interviewing with put on a hiring freeze. We spent the next few months searching for jobs. It was very stressful not having any income, but once again the Lord was teaching us to trust Him. I think He was also trying to teach us not to worry so much, because we used to worry about money when Derek had a job, which we realized was silly now that we had no income! Another hard lesson to learn. September and October were stressful months, and months in which we had to totally trust that the Lord would get us through. November/December 2008 - Derek found a job and started in November! It's a job with the county, in the human resources department. It's not something Derek wants to do indefinitely, but it's a job, and it's helping us pay many of our bills. Eventually Derek wants a job back in finance, but the Lord gave us this job and we're very grateful for it. I also got a temporary position filling in for a hygienist who was going on maternity leave, and I started that job in November. It was very helpful to have that job through Christmas; we were able to buy gifts for others and each other, and to pay some of the remaining bills for the month. My brother got married on December 15th to a wonderful girl named Olivia. It's a blessing to have another member to our family! Our first Thanksgiving and Christmas as a married couple were wonderful! We enjoyed being together and starting new traditions together. Tonight is New Year's Eve, and we plan on ringing in the New Year with a movie marathon! November and December have been months of enjoying being together and thanking the Lord for taking care of us. That the Lord would bring Derek and me good jobs that we enjoy, and that we'd be able to make all our bills and start saving money again. That He would continue to bless us and take care of us and our families through this New Year. This is a Christmas song by Alabama, and I think it's a good reminder of what exactly we're celebrating. I thought I'd share it here for those of you who may not have heard it. Say Christmas time is near. You helped us make it through. That's why I wrote this tune. This song is just for you. This song to you from me. My song is just for you. This song has always been special to me, because it's one of those songs that really brings the entire purpose of Christmas back into focus. Derek and I watched "The Nativity Story" last night. If you have not seen that movie, you should go out and buy it. It's definitely one worh having. These days the Christmas season encompasses so much - lights, presents, parties, family, decorations, cookies, etc. There's nothing wrong with enjoying everything Christmas brings, it's a wonderful time of the year. But I think we need songs like this, or movies like "The Nativity Story" to get us to slow down and really think about Christmas, and what it's all about. To get us to think of what happened about two thousand years ago, and the beautiful gift and sacrifice that our Lord gave to us that day. I have a confession to make. I am a wedding addict. The big cake, white dress, flowers, painted car, beautiful bride, nervous groom, crying mothers, the whole shebang. I think it started when I started doing research for my own wedding. All at once I found myself looking at wedding magazines, searching for flowers and dresses on the internet, watching wedding shows on TV. And I enjoyed it. I figured after I got married the interest in weddings would subside a little bit. But it was not to be; after I got married some of my friends started getting married (one of which is my little brother - he's getting married tomorrow). I found myself standing in line at the grocery store, wanting to buy the new Brides magazine, but somehow resisting. I love looking at pictures of weddings. Since I've got to know some of my friends who are married, I find myself searching for pictures of their weddings whenever I can. It's amazing to me how a bride looks so different on her wedding day. She can be a beautiful girl anyway, but somehow at her wedding there's a little transforming something that makes her even more radiant. I love going to weddings. I've informed my husband that whenever we are invited to a wedding, we're going. It doesn't even matter if I know the people who are getting married. I love seeing the different styles of different weddings, I love watching the bride walking down the isle, the groom's face when he sees her, the music, the style and cutting of the cake, the decorations, the choice of flowers, the bridesmaids dresses and the style of clothes the groomsmen wear, the kind of food, the throwing of the bouquet and garter, the rice throwing, what the groomsmen did to the car. I recently discovered a scrapbooking site, and I've been having alot of fun making my pictures into digital scrapbooks. But I must confess, I've also had fun searching for scrapbooks of other people's weddings, and studying all the items listed above. I think my favorite part of a wedding is the ceremony. It's a wonderful thing to see all of the guests who come together to watch a man and woman commit themselves to each other. I especially enjoy the vows. There's something beautiful about being a witness as a man and wife promise to be true to each other, to love each other, to always be there and take care of each other, until death seperates them. Weddings are wonderful, and yes, can be addicting, but I think it's the marriage that is truely what makes weddings attractive to me. Marriage is the most beautiful thing, when it is taken seriously, as God intended it to be. Yes, I am a little obsessed with weddings, but I'm not entirely certain it's a bad thing, because it isn't just the wedding, it's everything the wedding represents to me - an unconditional kind of love and commitment to each other, that should never end; marriage between a man and a woman that the Lord has created and blessed. That's what the wedding means to me. Maybe I should just be a wedding planner. But then I'd have to work on weekends. I'll think about it. End note: I got the image above from brides.com. Categories: About Me, marriage, Weddings Etc. "Carols Those Kids Used To Sing"
One of my favorite Christmas songs is "Carols Those Kids Used To Sing" by the Statler Brothers. I think I love it so much, because of the lyrics. I had a terrible time trying to find the lyrics to post on here, but if you would like to hear the song you can go to this link: http://www.cmt.com/artists/az/statler_brothers/800209/album.jhtml. Let Earth recieve her King! The carols those kids used to sing!" I think there are a few reasons why I love this song. One would be my own memories of Christmas caroling. I've been going to my church since I was ten years old, and every year our church gathers together in mid-December and goes caroling door to door. It was always such a joy to see people's faces light up when we came to sing at their house, and being able to carol with people I love made the experience fun and special. Most of my friends from those days have moved on; one by one they moved away, and they no longer come to our church. However, my wonderful memories of that time will always bring a smile to my face, and this song by the Statler Brothers reminds me of all the fun times we had caroling. I think another reason why I appreciate this song so much is because I feel like it captures the spirit of the Christmas season. The phrase "The Christmas Spirit" is very over-used in most Christmas movies and cards today, but who actually stops to think about what that means? Christmas can only be meaningful in the true way to those of us who are Christians, and I think the Christmas Spirit can only be fully understood by Christians. What is Christmas all about? Many people who do not believe in Christ would just say it was about being with family and friends, etc. But as we know, the true reason for Christmas is to celebrate the wonderful gift the Lord has given us by sending His Son. God Himself was born in a manger so that He could eventually die to save us from our sins. For Christians, that thought inspires us and makes the Christmas season something wonderful and special. And if God did such a thing for us, should we not serve God by serving other people? Doesn't the Christmas Spirit have to do with our joy and gratefulness to God for the Gift He has given us? Because of our joy and gratefulness to God, we show special kindnesses to those around us, and that's the source of the Christmas Spirit, that is so often referred to at this time of year. "Carols Those Kids Used To Sing" is special to me because it captures that true spirit of joy and thanks in a beautiful way, and it reminds me not only of my childhood, but also of the Reason why we celebrate, and it inspires me to do more for others. And aren't those three things really what Christmas is all about? Take some time to sing some carols this Christmas, and remember the source of the Christmas Spirit! "Thanks be to God for His Indescribable gift!" End note: I got the above image from www.ezthemes.com. O Give Thanks to Him Who Made . . . Since it's Thanksgiving tomorrow, I thought I'd post a hymn that I just found. I think it's a beautiful thanksgiving hymn. It's put to the music of "For the Beauty of the Earth" only the words are different, but beautiful just the same. The music was composed by Conrad Kocher, and the lyrics are by Josiah Conder. Guard of our unconscious hours. His, the mind’s immortal flame. Spirits to the Eternal Mind! Speak the Father’s love to man? Leading back His saints to God. I found this on www.cyberhymnal.org. If you would like to hear the melody you can go to the following link: http://www.cyberhymnal.org/htm/o/g/t/ogtthwma.htm. Listen to the music, read the lyrics, and remember to thank the Lord for all He has done for us - especially for giving His Son. I wish you all a joyful Thanksgiving! The Recent, Random Adventures of Me! This past Saturday afternoon we had about fifteen people in our house. Derek has a very big family, and his sisters haven't seen the house since we've moved in, so we thought we'd have his whole side of the family up for lunch. Our house is pretty small and we don't have very many chairs either, so it was an adventure! Derek bought three pizzas and I made spaghetti and fudge for something sweet. I've recently discovered that most fudge is not too hard to make; I've ben trying all kinds of different fudge, and it's all turned out pretty well. I've made white chocolate cherry-walnut fudge, carmel fudge, of course my mom's classic Christmas fudge, and today I'm trying out chocolate orange fudge. I should just open a little fudge shop and make some extra money on the side. We just decorated our house for Christmas the other night, so our gathering on Friday was almost like a pre-Christmas/Thanksgiving celebration only with pizza instead of a turkey or ham. It turned out really well and everyone seemed to enjoy themselves! It was our first big gathering at our house (we've had his parents up before, but that's only two people, and my family is only five). It builds my hostess-ing confidence to have had that many people here at once successfully! I think we're going to have them up again soon! Adventures as a Career Woman! I recently started a temporary job filling in for a hygienist who's going on maternity leave until January. For those of you who don't know, I'm a dental hygienist and I jsut graduated in May. So far I've only been doing temporary work. It's nice to just be in one office for a while, instead of always going from office to office. This work experience also helps me figure out what I'd like when I actually do get a permanent job. I'd like to only work two days a week, maybe three; I'm not enjoying being gone from home so much with this job. You don't appreciate it sometimes, but it really is a blessing to have days at home just to be a wife and clean the house and make something good for dinner. Don't get me wrong, the Lord gave me this job to get us through the holidays, and I'm grateful for it, but I don't think I want to work so much forever. Thankfully we can do just fine with me working only two days a week, so that's what I want for the long run. This job also is having me work past five every day so far. I've decided I definitely don't want to work evening hours in a permanent job. I don't like getting home so late and not being able to make Derek dinner, and then being so tired that I just want to go to bed. Evenings are my time with Derek, and I hate having to work into the evenings. I don't even want to do that in this job, and I think I'm going to have to ask if we can just keep my evening days to once a week. No job is perfect, and I'm definitely grateful for this one, but it has shown me that I should also be grateful for the time at home. I think it'll be good for me to get out of the house and work a couple days per week, but I'm also going to try to appreciate my time at home and use it to it's full advantage, and enjoy my house-keeping, wifely duties! Now that I don't have as much time for it I miss it. As of late I've also been enjoying looking for good inexpensive Christmas gifts since we don't have much money for gifts this year. I'm pretty proud of myself - I've found some good stuff so far. The dollar store is a wonderful thing! Today I'm hoping to leave here early and go buy Derek a present before work. I know he bought me one last week, even though he denies it! So hopefully I can get a gift for him under our tree before the end of the week! The other day I was shopping and I found these adorable little dog sweaters for only five dollars each (which is cheap for dog sweaters - don't you just love Walmart?). I couldn't resist, so I bought the dogs some Christmas sweaters! They look so cute in them! I'm pretty sure I have the cutest dogs ever. Everyone who was here on Saturday was fussing over the dogs; they thought they were pretty adorable. Quincy especially got alot of attention, I think because she was being more sociable than Ralphie. Ralphie gets nervous when there's so many people, and the whole time he just followed me around and hid between my feet. Either that or he was sitting on my lap. See, he knows he's a Mama's dog; I'm who he comes to for comfort! Adventures as a Praying Wife (at least trying to be)! I love that Derek let us put up our tree early! I love watching the lights twinkle. The other night I just turned off all the lights except the Christmas lights, and just sat on the couch and enjoyed them until Derek finished with his shower. It was very peaceful and relaxing, and it gave me a chance to spend some time in prayer - for those of you who read my previous post, I'm really trying! It's so much easier to pray when your relaxed and everything is peaceful, but I suppose I need to practice praying when things are hectic too. Christmas decorations and jsut the whole Christmas season tend to bring to my mind thoughts of the Lord, and so it's natural to pray then. Another reason I love Christmas. It really is the best time of the year, for so many reasons. I'm posting some pictures of our decorations and dogs, etc. This post was rather random, but I guess it's just a general update of our life together and my thoughts . . . I'm allowed one of those kind of blog posts every now and then! Derek and Me putting our "First Chrsitmas" ornament on the tree! 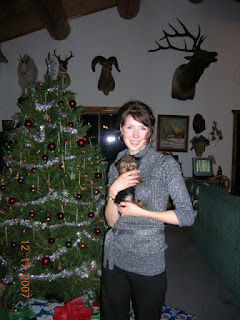 My sister Rachel holding Ralphie by the tree! Enjoying some wassel after all the decorating! Do you have failings? I suppose all of us do. A couple of my failings (and there are many) would be worrying, and being selfish. I don't know why I have to get anxious when I know that the Lord is in control and I just need to trust in Him. Trusting in the Lord is almost always easier said than done for me. And I don't know why! He's certainly done enough for me and my family that I have every reason to let go of my cares. But part of me always wants to worry. That's pretty silly when worrying does absolutely no good, and most of my worries are unfounded anyway. I know that with my head, but something in me stresses and worries, and it's very hard to control sometimes. I try and try not to worry, but I almost always fail in that area. Being selfish is the catagory that pretty much all of my other sins fall into. It's such a broad catagory that it's almost hard to write a paragraph about it - where do you start? But I guess to narrow it down, I don't do things for other people as often as I should. Just doing something helpful for someone else, or doing something yourself that someone else was supposed to do could be a great way to cultivate unselfishness. But once again I know it with my head; putting it into practice is alot more difficult. My pastor said something interesting last Sunday that prompted this post on failings. He was quoting from Lenord Ravenhill who said "Poverty in prayer is the seedbed of all our failures." When I think about it, I think that statement is very true. I know if I prayed more I would certainly worry less. And the more a person prays the more the Lord molds him into the image of Jesus - it's unavoidable; and if a person becomes more like Jesus they would by default become less selfish, because Jesus is the opposite of selfish. I also read a recent article by Steve Brown entitled "Good For Goodness Sake" (http://www.keylife.org/magazine/christmas-magazine-good-for-goodness-sake-2.html). In this article he made the point that if someone trys to be good, just to be good he will probably not succeed. However if that person spends more time in prayer, that person will automatically begin to cultivate goodness, just by praying, because they will cultivate a better relationship with the Lord. And the more a person realizes the Lord's love for them, the more they want to please Him. I think the Lord has been trying to prompt me to spend more time in prayer. All of my goals as far as goodness will be met much easier if I will just spend a few extra minutes in prayer. And not only that but I will develop my relationship with the Lord to a deeper level if I will devote more time in prayer. Prayer is hard for me. It always has been. Somehow when I'm praying I get the most distracted, and it's hard to keep focused. Because of the distraction (which I suspect is Satan throwing other things into my mind) I don't get much accomplished in prayer. I think I will try to make it my goal to change that. Once again, easier said than done; I've been trying for years to improve my praying habits. But I'm feeling convicted that I have not been focusing as much energy and attention to prayer as the Lord would want me to, and so changing in this area will be my goal. If you think of it you could pray for me! P.S. I think I'll be able to focus better if I have specific things to pray for, at least to start, so if any of you have any prayer requests, let me know. I can give you my e-mail if you would like to send them to me. Well, today it's snowing, and I'm happy. Derek is off at work, and I'm straightening up the house and I started a fire. Starting a fire is quite a feat for me, because I can't get a campfire going to save my life! Somehow it's easier in a wood stove. The dogs are wrestling around and playing, and I'm making cookies to bring to Derek at lunch. Today would be a perfect day to decorate for Christmas, but alas, Derek is going hunting this weekend and won't be home tonight. Some people in my state hate it when it snows and will hardly leave the house. I guess that's because at least half the state are transplants, and they aren't used to snow. But I think if the weather is going to be cold (which it always is this time of year), I'd rather it be snowing than just brown and icky looking. I grew up here though, so I guess I'm more used to it. I was watching the news this morning and everyone's all happy because it's supposed to be about 60 degrees again on Sunday. I'm not happy about that, I'm disappointed; I want the snow to stick around for a while. But we all know how the news can be wrong, right? When I think about it I'm amazed at how many different climates we have on this planet. Not only are there all the different climates for the different areas of the world, but there's also different climates within those areas for each season. God must be very creative. The world would be rather boring if it was only warm all the time. What a creative mind He must have to have thought of snow! And I love every minute of it! This is a picture of our backyard this morning; if you don't live somewhere where it's snowing, I offer my apologies out of sympathy! I'm just teasing, but take a minute to enjoy the weather wherever you are and think of God's creativity. Have a blessed weekend! That's right people! I am officially beginning the Christmas decoration season! It's okay if it isn't quite Thanksgiving yet. Derek and I are setting up our tree on the Novemeber 17th, so it will be up for a good month and a week! We have this nice pre-lit Christmas tree that my grandma gave us, and my mom found a box of Christmas ornaments in the basement of her work that no one is using and she gave them to us! I think the Lord knew we couldn't afford Christmas decorations this year, so He gave them all to us for free! I just don't understand those people who don't decorate for Christmas. It's the best time of the year, and I think it's as if this were the Lord's season (all the seasons are the Lord's of course, but especially Christmas)! It's Jesus's birthday; that's certainly reason to celebrate, and by George, decorating is a part of the celebration! I'm especially excited for Christmas this year, because it is the first Christmas Derek and I will spend as a married couple. I can't wait for all the festivities to commence, and it looks like it's going to snow outside, which is getting me into the spirit! Hence, the early decoration of my blog. This background reminded me of the song "Walking In a Winter Wonderland", so I decided to decorate with this one for now! All right all you Christmas lovers, let's hear it: Yay for Christmas and early decorating! P.S. This is a picture of me last Christmas holding Ralphie when he was still a puppy! But then again, he's not much bigger than that now. For those of you who don't know, Derek gave Ralphie to me when he proposed - the ring was tied around Ralphie's neck - and Derek is a huge CU Buffs fan, so I named Ralphie after the CU Buffs mascot. Derek was very happy with my name choice! "Facing An Uncertain Future with Peaceful Confidence"
After the election I was really depressed that Obama won. If it was any other democrat I think I would have handled it better, but this guy is about as radical as they get. I was mostly depressed because he says he's going to "fundamentally change this country", to use his own words. And anyone who has really been listening to him knows what that means: socialism. He'll do it sneaky at first and make it seem like he's just trying to "help the middle class", by taxing rich people to death. However, at first he was only going to raise taxes on anyone who makes more than 250,000 dollars a year, but now he's lowered that number to 120,000 dollars a year. Any doubt that the number will go down again? I wouldn't be surprised one bit. Pretty soon we'll all be giving up most of our salary for "redistribution" - "spreading the wealth around". When you think that our ancestors formed this country as a capitalist society, and that's one of the reasons why America is so great - why everyone else in the world wishes they lived here - and that Obama is going change all that - well, how can you help but be depressed? Boy, when I start to think about it I just start getting sad again. It still makes me depressed, but thanks to my sister, I now have a better perspective on things. "The world in which we live has no hope. . .The whole world yearns for peace, but knows no peace. Mankind's problems continually worsen, leaving many people without hope. Prophecy students, however, not only know what our loving God has planned for the future of this planet and the billions who live on it, but they also have a firm confidence toward the future and are not afraid. They not only know what the future holds; they also know the One who holds the future. . . This cofidence or hope is not automatic; it comes in response to the study of the Word of God in general as well as those passages that pertain to prophecy. And when we speak of hope, wer'e not talking about a casual hope that says 'We hope things will turn out all right.' No, we who are Christians are confident that the future will happen exactly as Christ predicted. We do not merely wish that Jesus will come again; we are confident that He will come again because He promised He would. The more we know about God's prophetic promises, the more convinced we will become of their future fulfillment. Those who are familiar with Bible prophecy are the only ones who can face what seems to be an uncertain future with peaceful confidence." I think we can all agree that the times ahead of us are uncertain (especially with You-Know-Who in office). Obama may be able to change our country and take everything good away from us, but he can never take away our belief and confidence that Christ is going to return for us. Through the study of prophecy God tells us exactly how things will turn out: He will prevail. This eases our worries and doubts about the future, because in the end God wins. And that is what gives me hope. My sister is one smart girl. I'm looking forward to learning more about biblical prophecy; it gives us the proper perspective, and it has been much too long since I have studied it. I'll be sure to share anything else interesting that I learn with ya'll! Yesterday we found out that Derek got the job we had been praying for! Praise the Lord! We're really thankful that he got this job; we have been praying that the Lord would allow Derek to get the job the He wanted him to have, so we know this is where we're supposed to be right now. Thank you to all of those who have been praying for us; we greatly appreciate your prayers, and I know they made a difference! To celebrate Derek and I went out to dinner and a movie, which we haven't been able to do too much lately. We went to see the movie Fireproof. Going in to it we weren't quite sure what to expect. Fireproof was made by the same church that created the movie Facing the Giants, so we figured the message would be good, but I know we each had our worries. One of them was how the acting and effects would be in this movie, and I was a little worried about the subject. I knew a movie about a couple trying to save their marriage would probably turn out good, but I was a little worried that it would be too serious and that the seriousness would make it hard to enjoy. The movie Fireproof is about a couple (Caleb and Katherine) who start out having serious marital problems. They are ready to get a divorce, but Caleb's father challenges him to wait 40 days to try a "Love Dare" in order to attempt to save their marriage. Caleb accepts his father's challenge and start the Love Dare, though Katherine doesn't know about it. In the end they realize their marriage is worth saving. You can go to http://www.pluggedinonline.com/ for a more thorough review. It turns out both our worries were unfounded. Maybe the acting/effects still weren't the best if you're going to be picky, but they were greatly improved from the chuch's previous production. The movie also had many jokes and funny situations, and Derek and I found ourselves laughing several times throughout the movie. Even more impressive was the way they worked in the gospel message (I thought it was done very well), and the entire premise was not only interesting to watch, but Derek and I thought the suggestions of the "Love Dare" in the movie could be very useful to apply to our marriage. I think we both compared our own actions to some of the do's and don'ts covered in the movie. When a film can make you laugh and help you improve an area in your life, I think it deserves an A! Barak Obama won the election last night. It was what I was most afraid of. My mom said you can either laugh or cry at a time like that. I found myself crying. I really love the United States of America (maybe sometimes too much for my own good), and I'm very proud of my country and what it has stood for from the day it was founded. It is one of the only places on earth where you can start with nothing and through hard work reach the "upper class". We have more rights in this country than any other I can think of, and we are free to live and believe as we wish, and do the best we can in life. It is a country that was founded and is based upon Christian principles, whether people will admit it or not, and I believe that is why the U.S. is so prosperous. I'm really afraid that this could all change now. It's like watching something die. I pray the Lord will preserve us and the United States of America over the next 4-8 years. "These all died in faith, not having received the promises, but having seen them from afar off were assured of them and confessed that they were pilgrims and strangers on the earth. For those who say such things declare plainly that they seek a homeland. And truly if they had called to mind the country from which they had come out, they would have had opportunity to return. But now they desire a better, that is, a heavenly country. Therefore God is not ashamed to be called their God, for He has prepared a city for them." I may love this country, but at a time like this I'm remembering that this isn't my real country. It's not my true homeland. God saw fit to allow me to live here for now, and I love it, but my citizenship actually lies somewhere else: in Heaven. In reality, Christians don't really belong anywhere in this world; we're sojourners, just passing through. And as stated above, may God preserve us until we finally reach our Homeland. Well, I'm posting this a little late. Today is election day, and I just remembered an essay I wrote a couple years ago about voting. Since it is election day I thought this would be an appropriate time to re-post it. This morning I was sitting in church as we started the prayer portion of our service, and my pastor stated a fact that I found pretty shocking. I can't remember the exact numbers, but he said of all the millions of Christians who live in the U.S. only half of them vote. I don't understand that. We live in a country where we can have a say as to the direction we go in the future. We have a voice; we have a vote. There are millions of people in other countries who would give anything to be able to have some effect on their governments. We live in a country where we have that right; where we have that opportunity. And yet so many people take that oppurtunity for granted. If any group should be voting it should be Christians. In Matthew Jesus said we are the salt of the earth. They used to use salt to keep meat from going bad. The only reason the world hasn't gone rotten is because God has put us here. And a major way that Christians can keep this country from going rotten it to vote. There are some serious moral issues that will be decided in the upcoming midterm elections. As my pastor said "The only thing a good man has to do to allow evil to prevail is nothing". I'm not going to do nothing. 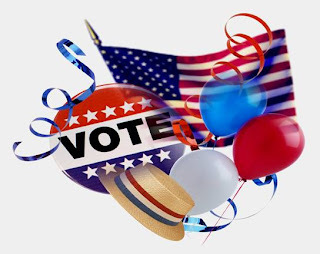 I am voting and covering election day in prayer. And I'd encourage any of you who can to do the same. So if you're registered to vote, get to the polls on election day. Let your voice be heard; keep the country from going bad. Use the opportunity God has given to you. And don't ever take it for granted. This year it's more important than ever for Christians to get out and vote for the candidate that more closely represents our Christian values; I personally believe that man to be John McCain, but every Christian must decide for themselves. So do your research, make a decision, and get out there to vote! End note: I got the above image from www.polkelections.com. "Gilbert was as yet little more than a boy; but a boy has his dreams as have others, and in Gilbert's future there was always a girl with big, limpid gray eyes, and a face as fine and delicate as a flower. He had made up his mind, also, that his future must be worthy of its goddess. Even in quiet Avonlea there were temptations to be met and faced. White Sands youth were a rather "fast" set, and Gilbert was popular wherever he went. But he meant to keep himself worthy of Anne's friendship and perhaps some distant day her love; and he watched over every word and thought and deed as jealously as if her clear eyes were to pass in judgement on it. She held over him the unconcious influence that every girl, whose ideals are high and pure, weilds over her friends; an influence that would endure as long as she was faithful to those ideals and which she would as certainly lose if she were ever false to them. In Gilbert's eyes Anne's greatest charm was the fact that she never stooped to the petty practices of so many of the Avonlea girls - the small jealousies, the little deceits and rivalries, the palpable bids for favor. Anne held herself apart from all this, not conciously or of design, but simply because anything of the sort was utterly foreign to her transparent, impulsive nature, crystal clear in it's motives and aspirations." I thought this was a beautiful description of something that I have witnessed myself: that when a persons holds high standards in their behaviour and speech, the people around them tend to live up to that person's standards, whether they realize it or not. My parents have always had high expectations of the behaviour of my siblings and me, and I have noticed many times, with my family members and myself, that people do tend to watch their own behaviour around us because of our high standards. I especially love the following line: "She held over him the unconcious influence that every girl, whose ideals are high and pure, wields over her friends; an influence that would endure as long as she was faithful to those ideals, and which she would as certainly lose if she was ever false to them." It's amazing that someone can so easily influence other people for the better, simply by holding pure ideals, but it's very true. But it's important not only to have high ideals yourself, but to practice them. As soon as you violate your own standards there is no reason for others to try to live up to them, because you yourself do not. This section of the book encouraged me to watch myself for any lapses in practicing my ideals, and I hope it encourages you too. You could be influencing those around you, and it's important to represent Christ in your actions and keep the best ideals possible; it could matter more than you know. End note: I got the above image from www.ddsbinfo.wordpress.com. A couple weeks ago my mom, who works at our local sheriff's office, told Derek and me that the animal control department just picked up a new dog. Apparently she was always kept outside and ran away several times, and the owner's didn't seem to want her; they hadn't returned any of the calls about the dog. Well, alas, before we knew it my mom said that she was taking the dog, and she was ours if we wanted her. Well, how could we say no? So, yes, we have another dog now. She is a Cairn terrior, and probably one of the happiest dogs I've ever met. You just look at her and she starts wagging her tail and smiles at you. We named her Quincy, and she and Ralphie are becoming great friends; they play all day long. I couldn't resist posting something on her and Ralphie, so here it is! Ralphie is alot better at pictures than Quincy. Quincy always turns her head right before I push the button, but Ralphie just sits there and looks at me like a pro! He should be in commercials! Dogs are great aren't they? They always love you, and love being around you, even if you yell at them sometimes. They seem to know if you are down and they just cuddle up to you and melt some of that sadness away. And they're great stress-relievers; they're always so excited and happy to see you! It's a blessing to have pets, and dogs seem especially to be a blessing, at least for me! Guess I'm a little biased though; I'm definitely a dog person! There's something about the changing of the seasons. It occurs so gradually, you hardly notice it's happening, but one day you can just feel in the air that the world has put one season behind and is tentatively stepping into the next. I especially notice this in the fall. In your head you may know that according to the calendar it should be autmun, but it isn't truly autumn until you feel it in the air. There's a certain crispness and spice that is felt more than seen or smelled or anything else. It starts with a certain "wiff" of fall-ness on a day that you would still be expecting summer. Then before you know it this season of change is in full swing. The leaves change and brilliantly paint the hills in color. The air is brisk, and you start to smell smoke from the chimneys of neighbors' houses. Soups, cidars, teas, and of course, candy corn are served once again, and pumpkins appear in the gorcery stores. Football games prevail on the TV (especially in our house; Broncos games, CU Buffs games, and any other game that may affect the aforesaid teams). My dad starts to scout for hunting seasons, we start target shooting for practice, and the camo and hunter's orange is brought out of the box. The ground is covered with a beautiful mixture of green, red, orange, and yellow, and the fallen leaves bring that wonderful spicy, musty fragrance that is impossible to reproduce and always seems to elicit warm, comfortable, contented feelings from me. My dad has always said that it is in the fall that he feels the most alive. I must have inherited some of that love of autumn from my dad, because I always feel exactly the same way when fall starts sneaking into the world and bringing with it the feelings that have always characterized the season for me. I think fall is one of the most beautiful exhibitions of the creativity of God, and I can't help but thanking Him for giving us a world with such amazing mountains, rivers, trees, and seasons. I think the reason I love the Autumn best is because there is a certain clarity, spice, and satisfaction that makes it so special. I feel alive, as my dad says, and I feel as if I'm home. I think Heaven must have a little bit of autumn in it; I think that maybe God created the fall to give us just a glimpse of how beautiful Heaven must be. But the fall can only be an imperfect glimpse of Heaven, like a dream is an imperfect, foggy glimpse of the world we know. One day death will blow that fog away, and we'll wake up to a more beautiful reality than we could ever imagine, and then we will really be alive. Because it reminds me of the beauty of Heaven, autumn will always be the most special season to me. With that thought, excuse me while I go enjoy a cup of Vanilla Maple tea and some candy corn. "Eye has not seen, nor ear heard, nor have entered into the heart of man the things which God has prepared for those who love Him." Well, it's been a really long time since I've posted anything on my blog, so I thought I'd better just sit down and write something. This week we're dog-sitting/house-sitting for my grandma, who is on a trip to Oregon. We're watching her pure-bred, white German Shepherd named Shatze. She's still a puppy, but she's a very large puppy and she has alot of energy to expend. Derek has figured out that if he chases her around the upper level of my grandma's house a few times it tires her out fairly well, and hopefully she won't gnaw on our feet for another couple hours. We've been having fun taking her to the dog park everyday, and she's a really cute, sweet dog. Derek and I are both out of work at the moment. Derek resigned from his previous position a couple weeks ago, and I haven't been working for about a month (it's a long story). Before all this happened Derek and I used to worry about money. It seems ridiculous to say now that we have no income at the moment. Well, that's not really true, because we are getting paid for house-sitting this week, and that money will be a big help. I think that in the long run this time without jobs will be a blessing to Derek and me. We've been learning to rely on the Lord much more. And this has been a huge lesson for me about worrying. What's the point of worrying anyway? Like I said, we used to worry about money when we had plenty to spare, and now that we don't it seems really silly. At the same time, now that we don't have much money, we aren't worrying about it as much as I would expect (maybe we're learning our lesson a little). I guess my lesson is to appreciate what you have now, even when things things aren't perfect, because things could get alot worse, and then you'll wonder why you used to worry so much. By the way, I think things are going to work out fine. I'm starting work with a new staffing agency on Monday, and I may have a potential permanent position. Derek has already got a few leads on jobs too. See, the Lord is already taking care of us, so we can enjoy our time off without being worried. Well, I'm off to dry off the floor (Shatze gets water everywhere when she drinks. My feet are always getting wet; good thing I'm not wearing socks! ), and make some dinner. And I'll try to write something again before another year passes (I know, that was pretty bad; I'm going to do better). Ta Ta! P.S. Matthew 6 is the "worry" chapter. It's qouted alot, because it's true. I also like Matthew 10:29-31. It's a really comforting thought. Welcome! I'm Callie, redeemed by Jesus's blood, imperfect and happy wife and mother. I love sharing my life with five little ones, recipes and DIY attempts, and book thoughts here, but I am most passionate about living each day with eternity in mind (and encouraging others to do the same). If you stick around, you will find some of my feeble attempts to make sense of this world as I observe it "through a clouded glass"; until someday when I reach my heavenly home and the Lord will make everything clear. Adoption America and Patriotism Babies Beauty Bible Study Blog Tips And Tricks Blogging Books Christian Living Cloth Diapering DIY Attempts Fashion Friendship From One To Two Health and Fitness Homeschooling marriage Maternity Fashion Maternity Wardrobe Tips Moms And Babies Feature Motherhood Parenting Party Ideas Photography Photos Politics Pregnancy Printables Pro-life Recipes and Food Reviews Sewing Tips And How-To's Toddlers Vlog Weddings Etc. © Through Clouded Glass. Design by MangoBlogs.